The Battle of Fallujah (2016), also referred to as Third Battle of Fallujah, or Fallujah offensive (2016), code-named Operation Breaking Terrorism (Arabic: عملية كسر الإرهاب‎) by the Iraqi government, was a military operation against ISIL launched to capture the city of Fallujah and its suburbs, located about 69 kilometers (40 miles) west of the Iraqi capital Baghdad. The operation began on 22 May 2016, three months after the Iraqi forces had started the total siege of Fallujah. On 26 June, Iraqi forces recaptured the city of Fallujah, before recapturing the remaining pocket of ISIL resistance in Fallujah's western outskirts two days later. Prior to the Battle of Fallujah, some Shia militias framed the impending campaign using extreme rhetoric, referring to the city as a "tumor" to be eradicated, as "Fallujah the whore," and as a "nest of traitors and criminals." The fight to retake Fallujah was often portrayed sectarian terms: for instance, one Shia militia launched rockets at the city painted with the word "Nimr" – referring to Nimr al-Nimr, the Shia cleric executed by Saudi Arabia earlier this year. On 23 May, 16 villages and districts on the eastern outskirts of Fallujah had been cleared by the Iraqi Security Forces. Included in this were the gains from a column in the northeast, which took the village of Sejar days after the recapture of Al-Karmah. These clashes resulted in the death of 40 ISIL militants. By 25 May, a total of 163 ISIL militants, 15 civilians and 35 Iraqi forces and militiamen were killed in clashes which gained the Iraqi army control over the remaining districts in the southeast, allowing them to create a corridor that cut the ISIL-controlled zone in two. During the day, it was reported an Iranian Basij member was killed in fighting near Fallujah. According to Qasm Araji, a member of the defense committee, the advancing forces are continuously gaining ground and "nearing Fallujah's Eastern gate." The Iraqi Army's advance into Fallujah stalled on Wednesday, 1 June, due to fierce resistance from ISIL fighters and concerns over protecting tens of thousands of civilians still trapped inside the strategic city, officials said. Civilians, including families, were moved to the city center and used as human shields by ISIL. With the operation in its second week, convoys of special forces could only inch forward on the dusty southern outskirts of the city as a handful of airstrikes sent up plumes of white smoke above clusters of low buildings on the fringes of the city's dense urban terrain. On 3 June, Iraqi forces moved into a southern neighbourhood of Fallujah. "The security forces have advanced from Naimiya neighbourhood to Shuhada," Lieutenant General Abdel Wahab al-Saadi, the operation's overall commander, told AFP. On the same day, Shi'ite militias uncovered a 6-kilometer-long (4 mi) tunnel in Saqlawiyah, linking the town to Fallujah, which had been used by ISIL militants to stall the offensive and evade airstrikes. On 4 June, Iraqi forces captured the town of Saqlawiyah and stormed a neighborhood in southern Fallujah. A Coalition airstrike killed all the ISIL militants trying to escape from Saqlawiyah on a raft. According to reports, 70 ISIL terrorists were killed during the capture of Saqlawiyah, including several foreign combatants. By 5 June, Iraqi forces had secured the southern edge of Fallujah, capturing the Naymiah neighborhood. A leader of the Popular Mobilization Units said that part of the western bank was the only area of Fallujah's outskirts that hadn't been secured by pro-government forces. Iraqi forces captured the neighbourhood of Al-Shuhada Al-Thaniya on 8 June. Five members of the Iraqi security services were injured during the fighting on that day. The move to capture the outlying area went quickly and forced Islamic State fighters to retreat into the heart of the city, the spokesman, Sabah al-Noman, told state television. Government forces were regrouping before beginning their next advance, he added. Iraq’s police chief said on 14 June that the forces cleared the Fallujah Barrage of ISIL forces and hoisted the Iraqi flag on the crest of the dam. Brigadier Shakir Jawdat said Iraqi forces are now in full control of the barrage, which is located south of Fallujah on the Euphrates River. The Iraqi forces also seized control over three villages of Za’anatha, Ziban, and Atr east of Fallujah. They also recaptured Abbas Jamil Bridge to facilitate the advance on the eastern neighborhoods of the city. On 16 June, the Federal Police announced it had retaken 25% of the city, capturing al-Khadra, al-Resala, Jubail, Fallujah Barrage, Nazim, al-Shuhada, the sewage station and a gas factory during the current phase to retake the city, during which 232 more ISIL militants were killed. On the same day, Lt. Gen. Raed Shaker Jawdat of Iraqi Federal Police said that ISIL militants had begun a "mass escape" from the city to areas of Halabisa and Albu Alwan west of Fallujah. He saw a "total collapse" among the ranks of ISIL. On the same day, Iraqi army started advancing from Fallahat vicinity to those areas in the western axis of Fallujah, killing 20 ISIL members and opening three routes for the passage of tanks and armored vehicles. At the same time, 900 families were evacuated. The government headquarters of Fallujah was captured by Iraqi forces on 17 June, after they retook several of the city's neighbourhoods in quick succession. During the battle, they faced little resistance from ISIL militants. The operation's commander Lieutenant General Abdul Wahab al-Saadi claimed that Iraqi forces were in control of 70% of the city. 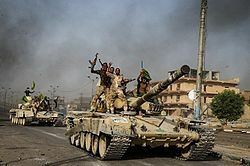 In the evening of 17 June, the Iraqi army reported on state television that Fallujah had been fully liberated, though the commander of special forces reported that 80 percent of the city had been recaptured, with ISIL fighters concentrated in four northern districts. Fighting was also still going on at nearby central hospital. On Iraqi state television, Prime Minister Haider al-Abadi congratulated the troops on their victories. The central hospital was recaptured by Iraqi forces on 18 June. The following day, the UN stated that about 80,000 civilians had managed to flee the city in the previous four weeks, many after ISIL reversed its policy of preventing civilians from escaping in mid-June. From 18 to 19 June, it was also reported that the remaining ISIL forces in Fallujah were beginning to collapse. On 19 June, it was reported that 50 ISIL militants had been killed in coalition air strikes and 15 others had been killed in clashes with Iraqi security forces. Also, more than 300 soldiers had died over the previous two days. On Monday, 27 June, the Iraqi Army advanced into Fallujah's western outskirts, to eliminate Islamic State militants holed up in the farmland west of Fallujah, to keep them from launching counterattacks on the city a day after Baghdad declared victory over ISIL there. Backed by airstrikes from the U.S.-led Coalition, Iraqi artillery bombarded targets, as troops closed in on up to 150 militants in areas along the southern bank of the Euphrates River Colonel Ahmed al-Saidi, who participated in Monday’s advance, said ground forces were moving cautiously to avoid triggering roadside bombs planted by ISIL. "They (holed-up militants) have two options: either they surrender or they get killed. We want to prevent them catching their breath and attacking our forces with car bombs." Early on 28 June, the Iraqi Government reported that 80% of areas of al-Halabisa, Albu Alwan and Albu Herat had been recaptured. Later on the same day, the Iraqi Army captured the Halabisa and Albu Alwan areas, fully recapturing Fallujah's western suburbs. Later that day, the U.S. Air Force conducted airstrikes against retreating ISIL convoys on the outskirts of Fallujah, killing at least 250 militants and destroying 40 vehicles. Overall, 348 militants were killed and more than 200 vehicles were destroyed throughout the day. An Iraqi official added that 450 vehicles belonging to the extremists were also destroyed in the process. The Federal Police Command announced dismantling a large laboratory for booby-trapped vehicles and manufacturing of explosives in central Fallujah. The laboratory contained tons of explosives, it added. The Federal Police Chief Lieutenant General Raed Shaker Jawdat said, "Today the security forces discovered a large laboratory for booby-trapped vehicles and explosives' manufacturing at Nezal in central Fallujah during the search operations carried out in the liberated areas. The booby-trapping laboratory that was found in Nezal was completely dismantled, while tons of explosives and detonators were found inside it." Anbar Provincial Council informed that the security forces secured the old road that links Ramadi with Fallujah and this will be used for the movement of military convoys only. Member of the security committee in Anbar Provincial Council Rajee Barakat al-Eissawi, in said, "The security forces secured the old road linking Ramadi and Fallujah. The road was secured after liberating some areas in Khalidiya from ISIS control." Eissawi added, "The security forces managed to liberate the international highway three days ago and managed to open the old road that extends to 44 km towards the new bridge of Fallujah." ^ Coalition aviation kills 13 ISIS fighters in Fallujah, IEDs laboratory destroyedIraqi News. ^ News Desk. "Updated battlefield map of Fallujah". Almasdarnews.com. Retrieved 27 May 2016. ^ Tomson, Chris. "Iraqi Army captures Sajar police station from ISIS – Fallujah map update". Almasdarnews.com. Retrieved 27 May 2016. ^ امین.ا. "آخرین وضعیت 8 ساعت پس از شروع پیشروی زمینی در عملیات فلوجه (نیمه شعبان) / نقشه :: تحولات جهان اسلام" (in Persian). Newss.blog.ir. Retrieved 27 May 2016. ^ "Iraq forces inch into Fallujah: commanders". France 24. 3 June 2016. Retrieved 12 June 2016. ^ "Senior Iraqi military officer killed by ISIS in S Fallujah". 19 June 2016. ^ Hawez, Abdulla (15 June 2016). "The Torturers Taking on ISIS in Fallujah". The Daily Beast. ^ Mamoun, Abdelhak (12 April 2016). "More than 4000 fighters to join cleansing battles in Fallujah — Iraqi News". ^ a b "ISIS leader of fallujah killed by US airstrike". The Independent. Retrieved 27 May 2016. ^ "Islamic State: Commander in Falluja killed says US". BBC News. Retrieved 27 May 2016. ^ "500 ISIS militants killed in Fallujah; Daesh security chief perished in Iraqi operation / Photos". 19 June 2016. ^ a b Malas, Nour (31 May 2016). "Iraqi Forces Begin Ground Assault on Fallujah". Wall Street Journal. ^ Bill Roggio and Amir Toumaj (27 May 2016). "Iranian-backed Iraqi militias signal readiness to enter Fallujah". The Long War Journal. Retrieved 27 May 2016. ^ Harris, Shane; Youssef, Nancy A. (18 May 2016). "This City Could Be the Next Big Battle of the ISIS War". The Daily Beast. ^ Abdelhak Mamoun (12 April 2016). "More than 4000 fighters to join cleansing battles in Fallujah". Iraqi News. Retrieved 1 May 2016. ^ "About 2500 IS militants killed in Fallujah: Iraqi commander". Deccan Chronicle. ^ a b "EXCLUSIVE: Iraqi troops' heavy toll for Fallujah victory is revealed". Middle East Eye. ^ "'Human Catastrophe' Unfolds As Iraqi Army And ISIS Clash Outside Fallujah". Huffington Post. Retrieved 31 May 2016. ^ "Falluja: Iraqi Shia militia 'killed and seized civilians'". BBC News. Retrieved 12 July 2016. ^ "Iraqi camps overwhelmed as residents flee Falluja fighting". Indian Express. 19 June 2016. Retrieved 19 June 2016. ^ a b "Iraqi forces retake two Falluja districts from Islamic State, push west". Reuters. 21 June 2016. Retrieved 21 June 2016. ^ "The Third Battle of Fallujah". World Affairs Journal. 31 May 2016. Retrieved 4 June 2016. ^ Richard Spencer (23 May 2016). "Will the third battle of Fallujah drain or deepen the swamp of terror?". Telegraph. Retrieved 28 May 2016. ^ الجيش العراقي يعلن انطلاق عمليات تحرير الفلوجة من داعش Al Mayadeen. ^ a b "Fallujah fully liberated from IS group, Iraqi commander says". Yahoo News. Retrieved 30 June 2016. ^ a b "Iraqi commander: 'Fallujah fight is over'". USA Today. Retrieved 30 June 2016. ^ a b "Iraqi commander: Fallujah 'fully liberated' from ISIS". Fox News. 26 June 2016. Retrieved 30 June 2016. ^ a b "Iraqi army claims liberation of Fallujah from ISIL". Al Jazeera. Retrieved 30 June 2016. ^ a b "Fallujah, the 'resistance' city, is liberated yet again – for the fourth time in a decade". THe Independent. 26 June 2016. Retrieved 30 June 2016. ^ a b Sarhan, Amre (28 June 2016). "Anbar Operations announces liberating al-Halabsa and Albu Elwan - Iraqi News". Retrieved 30 June 2016. ^ "PressTV-Iraq army prepares to retake Fallujah". Press TV. Retrieved 30 May 2016. ^ "Iraqi forces prepare offensive on IS-held Falluja". Reuters. Retrieved 30 May 2016. ^ "'Iraqi forces advancing toward Fallujah'". Press TV. Retrieved 27 May 2016. ^ "Is the Battle for Fallujah a Battle Against Fallujah?". Journal of Middle Eastern Politics and Policy. 15 June 2016. ^ "Iraq forces begin assault on ISIL bastion Fallujah". The National. AFP. ^ "Iraqi military claims advances in Islamic State-held Fallujah". The Washington Post. Retrieved 30 May 2016. ^ "Iran's Gen. Soleimani in Fallujah Operations Room". Fars News. Retrieved 27 May 2016. ^ "Iraqi Forces 'Liberate' Villages From ISIS During Fallujah Offensive". NBC News. Retrieved 30 May 2016. ^ Hume, Tim (26 May 2016). "Falluja offensive: Iraqi troops retake key town of Karma from ISIS". CNN. Retrieved 28 May 2016. ^ Salim, Mustafa (23 May 2016). "Iraqi military claims advances in Islamic State-held Fallujah". The Washington Post. Retrieved 28 May 2016. ^ Ryan, Missy (14 December 2012). "Mixed Iraqi force prepares for push into militant stronghold of Fallujah". The Washington Post. Retrieved 28 May 2016. ^ "Iraqi forces advance as Fallujah offensive begins". Kurdistan24. Retrieved 25 May 2016. ^ a b "Iraqi, allied militias advance on Fallujah; new tactics squeeze ISIS". Rudaw English. Retrieved 25 May 2016. ^ "خبرگزاری تسنیم - " حاج قربان نجفی" به جمع شهدای مدافع حرم استان گلستان پیوست". Tasnimnews.com. Archived from the original on 29 June 2016. ^ "Fallujah: Iraqi forces 'closing in' on ISIL-held city". Al-Jazeera English. Retrieved 28 May 2016. ^ "Iraq begins liberating heart of Fallujah". Al Arabiya English. Retrieved 28 May 2016. ^ Agence France-Presse. "Iraqi forces prepare to retake Fallujah". RTE.ie. Retrieved 30 May 2016. ^ Adel, Loaa (29 May 2016). "Baghdad Operations foils ISIS attempt to break security cordon in northern Fallujah". Iraqi News. Retrieved 30 May 2016. ^ Sarhan, Amre (29 May 2016). "Iraqi security forces retake vital bridge north of Fallujah". Iraqi News. Retrieved 30 May 2016. ^ Euan McKirdy; Joshua Berlinger. "ISIS fights Iraqi forces near Falluja, military says". CNN. ^ "Iraqi Army Advances Into Islamic State Stronghold of Fallujah As Suicide Attacks Rock Baghdad — VICE News". ^ "Iraqi forces intensify assault against ISIL in Fallujah". Al Jazeera. ^ "Iraqi troops drive into Fallouja in offensive to retake it from Islamic State". Los Angeles Times. ^ "Report: Iraqi forces in Fallujah repel ISIL attack". USA Today. 31 May 2016. ^ "Battle for Fallujah: Iraqi troops die in ISIL attacks". Al Jazeera. 2 June 2016. ^ "Report: Fallujah fight stalled by fierce fighting civilian concerns". Boston Herald. 1 June 2016. ^ "Iraq: ISIL Transferring Huge Amount of Jewelries from Fallujah to Mosul". Fars News. 31 May 2016. ^ Fallujah Operations announces killing 50 ISIS members south of Fallujah. Iraqi News. ^ 12 ISIS fighters killed in airstrike in western Fallujah. Iraqi News. ^ "Iraq forces inch into Fallujah: commanders". France24. 3 June 2016. ^ "Battle for Fallujah: Isis sniper 'moles' use four-mile-long tunnel to stall Iraq offensive". International Business Times. 3 June 2016. Retrieved 12 June 2016. ^ "Anti-ISIS forces defeat militants in battle for Falluja". CNN. 5 June 2016. Retrieved 5 June 2016. ^ "Over 70 isis terrorists killed during al-saqlawiyah liberation". Almasdarnews.com. 4 June 2016. Retrieved 5 June 2016. ^ "Iraqi forces secure southern edge of Fallujah". Al Jazeera. Retrieved 12 June 2016. ^ "Iraqi civilians drown fleeing Fallujah as city nearly encircled". The Daily Star. Beirut, Lebanon. 6 June 2016. Retrieved 12 June 2016. ^ "Iraqi forces seize part of southern Fallujah from IS". au.news.yahoo.com. Retrieved 12 June 2016. ^ "Iraqi Counterterrorism Forces Enter Fallujah". The Wall Street Journal. 8 June 2016. ^ "Iraq special forces 3km from Fallujah centre". Daily Mail. 10 June 2016. ^ "ISIL attack on army barracks near Fallujah kills dozens". Al Jazeera. 12 June 2016. ^ "Iraqi troops face booby traps, tunnels packed with explosives as they advance on Fallujah". The Washington Post. Retrieved 12 June 2016. ^ "Thousands flee Fallujah using 1st safe exit route secured by Iraqi army". CBC News. 12 June 2016. ^ "Battle for Fallujah: 500 ISIS fighters captured fleeing Iraqi city posing as refugees". International Business Times. ^ "Iraq recaptures Fallujah Barrage from Daesh". Press TV. 14 June 2016. ^ "Federal Police announces killing 232 militants, liberating 25% of Fallujah". Iraqi News. 16 June 2016. Retrieved 17 June 2016. ^ ISIS elements begin mass escape from central Fallujah, says Federal Police, Iraqinews.com, 16 June 2016. ^ 20 ISIS members killed during battles in western Fallujah, Iraqinews.com, 16 June 2016. ^ "Iraq forces retake Fallujah government HQ". Yahoo7. 17 June 2016. Retrieved 17 June 2016. ^ Iraqi Forces Enter Central Fallujah, Liberate Key Areas from ISIS, Nbcnews.com, 17 June 2016. ^ "Iraqi forces recapture main hospital in Fallujah, driving ISIS further out". The Washington Post. 18 June 2016. Retrieved 18 June 2016. ^ "IS conflict: Falluja 'humanitarian disaster' warning". BBC. 19 June 2016. Retrieved 20 June 2016. ^ "Isis has lost Fallujah". The Independent. 17 June 2016. ^ "IS conflict: Iraqi forces 'retake most' of Falluja". BBC News. 17 June 2016. ^ "Battle for Fallujah continues". SBS News. Retrieved 21 June 2016. ^ "More than 300 soldiers killed in two days". Al Jazeera. 19 June 2016. Retrieved 19 June 2016. ^ "US-Led Coalition Says Only 1/3 of Fallujah Cleared of IS". ABC News. Retrieved 22 June 2016. ^ "Iraqi commander claims about 2,500 ISIS militants killed in Fallujah". Daily News & Analysis. 22 June 2016. ^ "Fallujah in ruins after Iraqi forces retake '90%' of the city from Isil". The Telegraph. 22 June 2016. ^ "Iraq's Fallujah nearly cleared but aid effort flounders". Daily Mail. Retrieved 25 June 2016. ^ "Iraqi flag raised in liberated Fallujah neighborhood". Al Arabiya English. 25 June 2016. Retrieved 25 June 2016. ^ "Iraq claims complete control over Fallujah, Islamic State resistance collapse". News.com.au. 26 June 2016. Retrieved 27 June 2016. ^ "Falluja: Iraq PM Haider al-Abadi hails recapture from IS". BBC. 26 June 2016. Retrieved 27 June 2016. 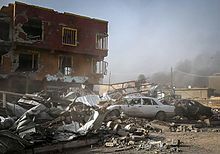 ^ "Iraqi Forces Assess The Damage To Fallujah As They Secure The City". Huffington Post. ^ Adel, Loaa (28 June 2016). "80 pc areas to west and south of Fallujah liberated - Iraqi News". Retrieved 30 June 2016. ^ "Iraqi jets wipe out 2,000 fleeing Isis fighters". The Times. Retrieved 30 June 2016. ^ "U.S. Strike Kills 250 Islamic State Fighters Near Fallujah". Huffington Post. Retrieved 29 June 2016. ^ a b "Falluja: Iraqi forces, tribal fighters thwart Daesh onslaught on Amiriyah Fallujah". Press TV. 29 June 2016. ^ "Federal Police dismantle laboratory of booby-trapped vehicles in Fallujah". 2 July 2016. This page was last edited on 8 April 2019, at 22:54 (UTC).